At the University of San Diego, President Mary E. Lyons presented the Dalai Lama with the USD Medal of Peace. 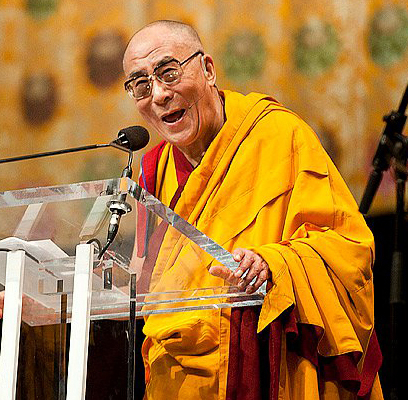 At the USD Jenny Craig Pavilion before a full house, the Dalai Lama spoke about peace, compassion and nonviolence. He asked what is the meaning of peace? Is it the absence of trouble or violence? He explained that scientists are beginning to learn about the value of creating an internal balance and a calm mind in helping people recover from illness faster. A calm mind, he said, is the remedy for the loss of hope and a destroyer of fear, distrust and hate. Stating that the energy to restore our happiness is within ourselves, the Dalai Lama urged further study of the relationship of the mind with the emotions to learn about the destroyers of inner peace. He stressed the value of education through which awareness can be developed so we can get an understanding of our inner world and achieve inner peace after which justice automatically comes. Speaking about materiality, the Dalai Lama recognized that material things can bring physical comfort, “but not mental comfort.” He gave as an example that some people have plenty of money and “still are not happy.” No matter what you?re surroundings, he said, you can keep peace of mind. Thanks for your comment, Amber. I must say that I was surprised at how human the Dalai Lama is. I had never heard him speak before yesterday and I was very moved. He is a very humble man. And so happy.